In 1687, Sir Isaac Newton published his groundbreaking book, Mathematical Principles of Natural Philosophy, which described his three laws of motion. In the process, Newton laid the foundation for classical mechanics and redefined the way the world regarded physics and science. What most people don’t know, however, is that Newton’s three laws of motion can be used as an interesting analogy for increasing your productivity, simplifying your work and improving your life. In many ways, procrastination is a fundamental law of the universe. Objects at rest do tend to stay at rest. So, what’s the best way to get started when you are stuck procrastinating? Here’s the Two-Minute Rule, adjusted for productivity: To overcome procrastination, find a way to start your task in less than two minutes. Notice that you don’t have to finish your task. In fact, you don’t even have to work on the primary task. However, thanks to Newton’s first law, you’ll often find that once you start this little two-minute task, it is much easier to keep moving. – Right now, you may not feel like going for a run. But, if you put your running shoes on and fill up your water bottle, that small start might be enough to get you out the door. – Right now, you might be staring at a blank screen and struggling to write your report, but if you write random sentences for just two minutes, then you may find that useful sentences will start to come. – Right now, you might have a creative block and be struggling to draw something, but if you draw a random line on a sheet of paper and turn it into a dog, then you might get your creative juices flowing. 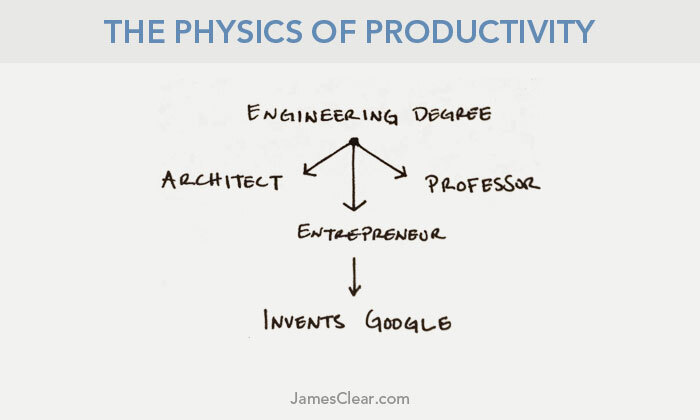 Let’s break down this equation, F=ma, and figure out how it can apply to productivity. There is one important thing to note in this equation. The force, F, is a vector. Vectors involve both magnitude (how much work you are putting in) and direction (where that work is focused). In other words, if you want to get an object accelerating in a particular direction, then the size of the force you apply and the direction of that force will both make a difference. Guess what? It’s the same story for getting things done in your life. If you want to be productive, it’s not merely about how hard you work (magnitude), it’s also about where that work is applied (direction). This is true of big life decisions and small daily decisions. We all have an average speed at which we tend to perform in life. 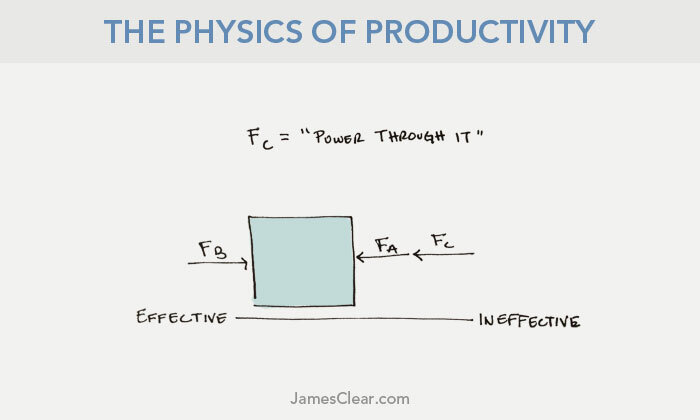 Your typical levels of productivity and efficiency are often a balance of the productive and unproductive forces in your life — a lot like Newton’s equal and opposite forces. There are productive forces in our lives like focus, positivity and motivation. There are also unproductive forces like stress, lack of sleep and trying to juggle too many tasks at once. The first option is to add more productive force. This is the “power through it” option. We gut it out, drink another cup of coffee and work harder. This is why people take drugs that help them focus or watch motivational videos to pump themselves up. It’s all an effort to increase productive force and overpower the unproductive forces we face. Obviously, you can only do this for so long before you burn out, but for a brief moment, the “power through it” strategy can work well. The second option is to eliminate the opposing forces. Simplify your life, learn how to say no, change your environment, reduce the number of responsibilities that you take on and otherwise eliminate the forces that are holding you back. If you reduce the unproductive forces in your life, your productivity will glide forward naturally. Most people try to power through and hammer their ways past the barriers. The problem with this strategy is that you’re still dealing with the other force. I find it to be much less stressful to cut out the opposing forces and let your productivity naturally flow forward. 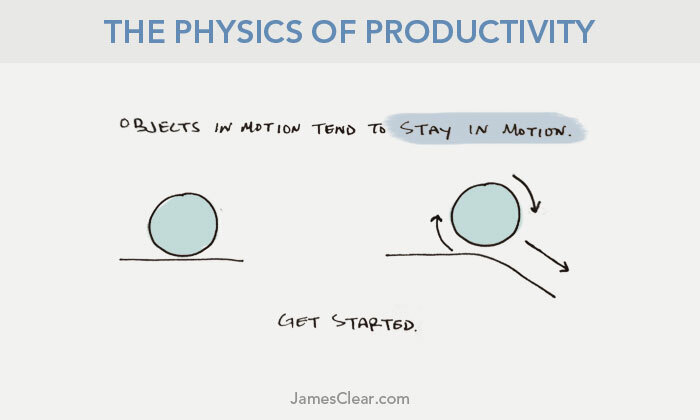 Newton’s laws of motion reveals insights that tell you pretty much everything you need to know about how to be productive. 1. Objects in motion tend to stay in motion. Find a way to get started in less than two minutes. 2. It’s not just about working hard; it’s also about working on the right things. You have a limited amount of force and where you apply it matters. 3. 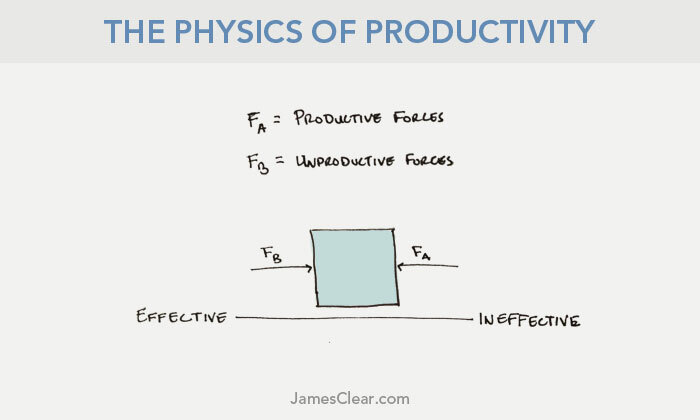 Your productivity is a balance of opposing forces. 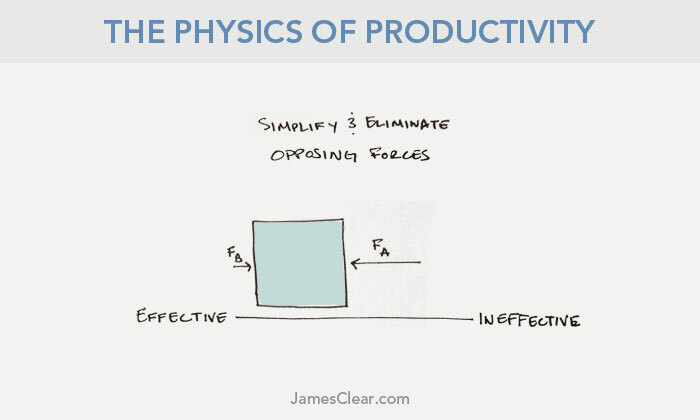 If you want to be more productive, you can either power through the barriers or remove the opposing forces. The second option seems to be less stressful. 1. Psychology studies have also revealed that it is easier for us to stay in motion once we have started. Actually, what the studies show is that our human brains have a strong urge to finish tasks that we start. We don’t like leaving things unfinished or partially done. This is a widely research phenomenon known as the Ziegarnik Effect, named after the Soviet psychologist Bluma Zeigarnik. 2. After writing this post, I found out that Stephen Guise has also written about the idea of “objects in motion, stay in motion” in his book, Mini Habits. 3. The 2-Minute Rule originally comes from David Allen’s best-selling book, Getting Things Done. 4. Kurt Lewin first thought of the idea of Force Field Analysis, which refers to analyzing supporting and opposing forces. This is the same man who is responsible for Lewin’s Equation. Thanks to Rob Norback, for sharing the idea behind the “third law of productivity,” which sparked this post. 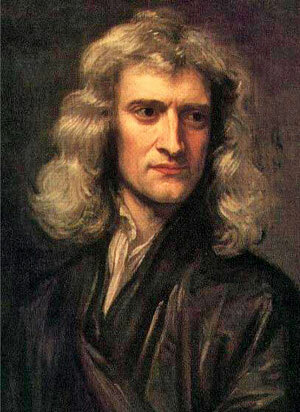 Also, thanks to Sir Isaac Newton, for being a man ahead of his time and for being a bold mofo, who owned his rockstar hair.